The material of a magnetic core (often made of iron or steel) is composed of small regions called magnetic domains that act like tiny magnets (see ferromagnetism). Before the current in the electromagnet is turned on, the domains in the iron core point in random directions, so their tiny magnetic fields cancel each other out, and the iron has no large-scale magnetic field. When a current is passed through the wire wrapped around the iron, its magnetic field penetrates the iron, and causes the domains to turn, aligning parallel to the magnetic field, so their tiny magnetic fields add to the wire's field, creating a large magnetic field that extends into the space around the magnet. The effect of the core is to concentrate the field, and the magnetic field passes through the core more easily than it would pass through air. The larger the current passed through the wire coil, the more the domains align, and the stronger the magnetic field is. Finally, all the domains are lined up, and further increases in current only cause slight increases in the magnetic field: this phenomenon is called saturation. When the current in the coil is turned off, in the magnetically soft materials that are nearly always used as cores, most of the domains lose alignment and return to a random state and the field disappears. However, some of the alignment persists, because the domains have difficulty turning their direction of magnetization, leaving the core a weak permanent magnet. This phenomenon is called hysteresis and the remaining magnetic field is called remanent magnetism. The residual magnetization of the core can be removed by degaussing. In alternating current electromagnets, such as are used in motors, the core's magnetization is constantly reversed, and the remanence contributes to the motor's losses. in this definition is amperes.
. So in equation (1) above, the second term dominates. Therefore, in magnetic circuits with an air gap, the strength of the magnetic field B depends strongly on the length of the air gap, and the length of the flux path in the core doesn't matter much. Given an air gap of 1mm, a magnetomotive force of about 796 Ampere-turns is required to produce a magnetic field of 1T. is the cross-sectional area of the core. The force equation can be derived from the energy stored in a magnetic field. Energy is force times distance. Rearranging terms yields the equation above. In more intuitive units it's useful to remember that at 1 T the magnetic pressure is approximately 4 atmospheres, or kg/cm2. It can be seen that to maximize the force, a core with a short flux path L and a wide cross-sectional area A is preferred (this also applies to magnets with an air gap). To achieve this, in applications like lifting magnets (see photo above) and loudspeakers a flat cylindrical design is often used. The winding is wrapped around a short wide cylindrical core that forms one pole, and a thick metal housing that wraps around the outside of the windings forms the other part of the magnetic circuit, bringing the magnetic field to the front to form the other pole. This model doesn't give the correct magnetic field inside the core and thus gives incorrect results if the pole of one magnet gets too close to another magnet. The only power consumed in a DC electromagnet under steady state conditions is due to the resistance of the windings, and is dissipated as heat. Some large electromagnets require cooling water circulating through pipes in the windings to carry off the waste heat. If an ordinary switch is used to control the winding current, this can cause sparks at the terminals of the switch. This doesn't occur when the magnet is switched on, because the limited supply voltage causes the current through the magnet and the field energy to increase slowly, but when it is switched off, the energy in the magnetic field is suddenly returned to the circuit, causing a large voltage spike and an arc across the switch contacts, which can damage them. With small electromagnets a capacitor is sometimes used across the contacts, which reduces arcing by temporarily storing the current. More often a diode is used to prevent voltage spikes by providing a path for the current to recirculate through the winding until the energy is dissipated as heat. The diode is connected across the winding, oriented so it is reverse-biased during steady state operation and doesn't conduct. When the supply voltage is removed, the voltage spike forward-biases the diode and the reactive current continues to flow through the winding, through the diode and back into the winding. A diode used in this way is called a freewheeling diode or flyback diode. Eddy currents: From Faraday's law of induction, the changing magnetic field induces circulating electric currents inside nearby conductors, called eddy currents. The energy in these currents is dissipated as heat in the electrical resistance of the conductor, so they are a cause of energy loss. Since the magnet's iron core is conductive, and most of the magnetic field is concentrated there, eddy currents in the core are the major problem. Eddy currents are closed loops of current that flow in planes perpendicular to the magnetic field. The energy dissipated is proportional to the area enclosed by the loop. To prevent them, the cores of AC electromagnets are made of stacks of thin steel sheets, or laminations, oriented parallel to the magnetic field, with an insulating coating on the surface. The insulation layers prevent eddy current from flowing between the sheets. Any remaining eddy currents must flow within the cross-section of each individual lamination, which reduces losses greatly. Another alternative is to use a ferrite core, which is a nonconductor. When a magnetic field higher than the ferromagnetic limit of 1.6 T is needed, superconducting electromagnets can be used. Instead of using ferromagnetic materials, these use superconducting windings cooled with liquid helium, which conduct current without electrical resistance. These allow enormous currents to flow, which generate intense magnetic fields. Superconducting magnets are limited by the field strength at which the winding material ceases to be superconducting. Current designs are limited to 10–20 T, with the current (2017) record of 32 T. The necessary refrigeration equipment and cryostat make them much more expensive than ordinary electromagnets. However, in high power applications this can be offset by lower operating costs, since after startup no power is required for the windings, since no energy is lost to ohmic heating. They are used in particle accelerators and MRI machines. Both iron-core and superconducting electromagnets have limits to the field they can produce. Therefore, the most powerful man-made magnetic fields have been generated by air-core nonsuperconducting electromagnets of a design invented by Francis Bitter in 1933, called Bitter electromagnets. 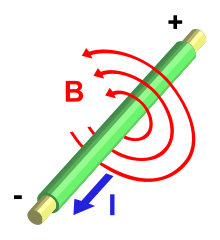 Instead of wire windings, a Bitter magnet consists of a solenoid made of a stack of conducting disks, arranged so that the current moves in a helical path through them, with a hole through the center where the maximum field is created. This design has the mechanical strength to withstand the extreme Lorentz forces of the field, which increase with B2. The disks are pierced with holes through which cooling water passes to carry away the heat caused by the high current. The strongest continuous field achieved solely with a resistive magnet is 37.5 T as of 31 March 2014[update], produced by a Bitter electromagnet at the Radboud University High Field Magnet Laboratory in Nijmegen, the Netherlands. The previous record was 35 T. The strongest continuous magnetic field overall, 45 T, was achieved in June 2000 with a hybrid device consisting of a Bitter magnet inside a superconducting magnet. A hollow tube type of explosively pumped flux compression generator. The factor limiting the strength of electromagnets is the inability to dissipate the enormous waste heat, so more powerful fields, up to 100 T, have been obtained from resistive magnets by sending brief pulses of high current through them; the inactive period after each pulse allows the heat produced during the pulse to be removed, before the next pulse. The most powerful manmade magnetic fields have been created by using explosives to compress the magnetic field inside an electromagnet as it is pulsed; these are called explosively pumped flux compression generators. The implosion compresses the magnetic field to values of around 1000 T for a few microseconds. While this method may seem very destructive, it is possible to redirect the brunt of the blast radially outwards so that neither the experiment nor the magnetic structure are harmed. These devices are known as destructive pulsed electromagnets. They are used in physics and materials science research to study the properties of materials at high magnetic fields. ^ a b c d e Nave, Carl R. (2012). "Electromagnet". Hyperphysics. Dept. of Physics and Astronomy, Georgia State Univ. Archived from the original on September 22, 2014. Retrieved September 17, 2014. ^ a b c d e f g h i j k l m n o p Merzouki, Rochdi; Samantaray, Arun Kumar; Pathak, Pushparaj Mani (2012). Intelligent Mechatronic Systems: Modeling, Control and Diagnosis. Springer Science & Business Media. pp. 403–405. ISBN 978-1447146285. Archived from the original on 2016-12-03. ^ Sturgeon, W. (1825). "Improved Electro Magnetic Apparatus". Trans. Royal Society of Arts, Manufactures, & Commerce. 43: 37–52. cited in Miller, T.J.E (2001). Electronic Control of Switched Reluctance Machines. Newnes. p. 7. ISBN 978-0-7506-5073-1. Archived from the original on 2016-12-03. ^ Windelspecht, Michael. Groundbreaking Scientific Experiments, Inventions, and Discoveries of the 19th Century Archived 2017-01-11 at the Wayback Machine, xxii, Greenwood Publishing Group, 2003, ISBN 0-313-31969-3. ^ Cavicchi, Elizabeth. "Series and Parallel Experimenting with Electromagnets" (PDF). Pavia Project Physics, Univ. of Pavia, Italy. Archived (PDF) from the original on March 15, 2016. Retrieved August 22, 2015. ^ Sherman, Roger (2007). "Joseph Henry's contributions to the electromagnet and the electric motor". The Joseph Henry Papers. The Smithsonian Institution. Archived from the original on 2012-06-08. Retrieved 2008-08-27. ^ "Schweigger Multiplier – 1820". Maglab. National High Magnetic Field Laboratory. Archived from the original on 17 October 2017. Retrieved 17 October 2017. ^ a b Dawes, Chester L. (1967). "Electrical Engineering". In Baumeister, Theodore. Standard Handbook for Mechanical Engineers (7th ed.). McGraw-Hill. p. 15-105. ^ Underhill, Charles R. (1906). The Electromagnet. D. Van Nostrand. p. 113. Archived from the original on 2016-05-01. ^ Millikin, Robert; Bishop, Edwin (1917). Elements of Electricity. Chicago: American Technical Society. p. 125. Archived from the original on 2017-01-11. ^ Fleming, John Ambrose (1892). Short Lectures to Electrical Artisans, 4th Ed. London: E.& F. N. Spon. pp. 38–40. Archived from the original on 2017-01-11. ^ Gates, Earl (2013). Introduction to Basic Electricity and Electronics Technology. Cengage Learning. p. 184. ISBN 978-1133948513. Archived from the original on 2017-01-10. ^ Shipman, James; Jerry, Wilson; Todd, Aaron (2009). Introduction to Physical Science (12 ed.). Cengage Learning. pp. 205–206. ISBN 978-1111810283. Archived from the original on 2017-01-11. ^ a b c "Saturation flux levels of various magnetic materials range up to 24.5 kilogauss" (2.5 T) p.1 "Silicon steel saturates at about 17 kilogauss" (1.7 T) p.3 Pauley, Donald E. (March 1996). "Power Supply Magnetics Part 1: Selecting transformer/inductor core material". Power Conversion and Intelligent Motion. Archived from the original on December 24, 2014. Retrieved September 19, 2014. ^ The most widely used magnetic core material, 3% silicon steel, has saturation induction of 20 kilogauss (2 T). "Material Properties, 3% grain-oriented silicon steel". Catalog. Magnetic Materials Co. 2013. p. 16. Archived from the original on September 20, 2014. Retrieved September 19, 2014. ^ a b c "Magnetic steel fully saturates at about 2 T" Short, Thomas Allen (2003). Electric Power Distribution Handbook. CRC Press. p. 214. ISBN 978-0203486504. ^ Feynman, Richard P. (1963). Lectures on Physics, Vol. 2. New York: Addison-Wesley. pp. 36–9 to 36–11, eq. 36–26. ISBN 978-8185015842. ^ a b Fitzgerald, A.; Kingsley, Charles; Kusko, Alexander (1971). Electric Machinery, 3rd Ed. USA: McGraw-Hill. pp. 3–5. ^ "32 Tesla All-Superconducting Magnet". National High Magnetic Field Laboratory, USA. 2018. ^ a b c "Mag Lab World Records". Media Center. National High Magnetic Field Laboratory, USA. 2008. Archived from the original on 2008-10-07. Retrieved 2008-08-31. ^ a b c Coyne, Kristin (2008). "Magnets: from Mini to Mighty". Magnet Lab U. National High Magnetic Field Laboratory. Archived from the original on 2008-09-17. Retrieved 2008-08-31. ^ "HFML sets world record with a new 37.5 tesla magnet". High Field Magnet Laboratory. 31 March 2014. Archived from the original on 4 September 2015. Retrieved 21 May 2014. ^ "What is the strongest magnet in the world?". Apex magnets. November 2014. Archived from the original on February 5, 2017. Retrieved February 5, 2017. ^ Coyne, Kristin (2008). "7. Pulsed Magnets: Brief Shining Moments". Magnets from Mini to Mighty. National High Magnetic Field Laboratory. Archived from the original on 2014-12-20. Retrieved 2014-05-21.